The new Coleman Northstar 10P DarkRoom Tent features new dark room technology that blocks sunlight to keep the tent darker if you want to sleep while the sun is up and also reduces how much the tent heats up during the day! The DarkRoom technology is a special coating on the rainfly and windows that blocks out up to 95% of sunlight, reduces heat in the tent by up to 5 degrees, therefore keeping you cooler in the day! During the longer summer days, the DarkRoom technology is great for getting the kids to bed earlier and waking up later! 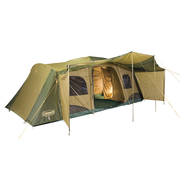 The Coleman Northstar 10P tent is the first-to-market instant family cabin tent. All the benefits of a large family cabin style tent with the convenience of an instant up frame. There are no poles to assemble, and with pre-tied guy ropes the tent is ready to go as soon as it comes out of the bag. Just 3 minutes and your tent is done! Perfect for the medium to large family, the Northstar features a central living space and 2 x bedrooms. The large mesh D-door takes you from the outside into the central living space, and the mesh and privacy screen doors lead into either of the bedrooms. While the rear screened D-doors allow independent access to and from the bedrooms with pole-out awnings. The main awning provides an outside area for the family to gather, enjoy meals, play or relax whilst protected from the elements. 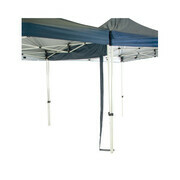 The awning can be set up as individual awnings or full length with zip back wind breaks. Featuring a superior Ripstop fly, and patented WeatherTec System welded floors and inverted seams, you will be kept dry from the rain. The engineered circle ventilation system ensures superior airflow around the tent. This will keep you cool in summer, and help to combat condensation in humid conditions! The Coleman Northstar 10P tent - Just 3 minutes and your tent is done! This tent has some great qualities but it's not perfect. The frame is quick and simple to put up when you know what you're doing. The fly as always takes the most time and erecting the awning adds to this time considerably. That said, the awning is one of he winning features of this tent. It provides covered entry for wet weather, a workable shaded living area with side panel wind breaks and fits really well with my 4.5mtr gazebo. The interior has three good sized private rooms with storage pockets, but the hooks to hang lights from are nearly non-existent (my least favourite aspect of the tent). When both set up and packed away the tent is large which can restrict transport inside most cars and and some smaller camp sites. 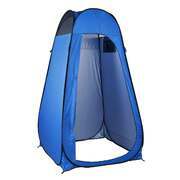 Overall this tent performs well and is of good quality, it has a few drawbacks but is a good choice for a quick get away.